James Belushi has agreed to team with Diane English and Barry Levinson for an hourlong TV drama that will cast him as a defense attorney character modeled after the famed lawyer and TV commentator Mickey Sherman. ...... Sherman wrote the memoir “How Can You Defend Those People?,” and the idea is for Belushi to play a likable (ex-)prosecutor who defends the guilty and innocent with equal vigor. 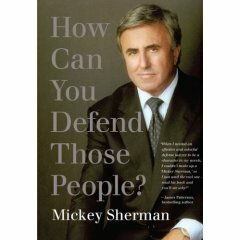 My good pal Mickey Sherman has a new book out this week, How Can You Defend Those People? Mickey is not only a great lawyer, he's a very funny guy. The book is eminently readable and entertaining, while at the same time, it offers us glimpses into the criminal justice system from the defense lawyer's point of view. ABC is excerpting some chapters. My favorite (because I'm in it) is Chapter 4, " Are There Cases or Clients You Won't Take?" While a few named crimes that they thought were particularly heinous, others (and I'm in this category) listed crimes that we thought we'd bring personal baggage to that might preclude us from providing our best representation which we know the client is entitled to and which we would want to provide.